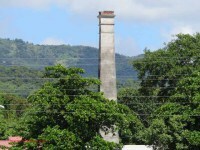 This hacienda, which chimney dates back to 1871, was also known as Hacienda Quilichini as it was owned by the Quilichini family, it operated until 1920. It appears that the first Quilichini to own the property was Santiago Quilichini Peretti (1851- ), a Corsican immigrant who arrived in Puerto Rico ca. 1871 and married Vicenta Ramirez de Arellano from San Germán. It was later passed by marriage to Manuel Rodriguez Soto. Its last known owner in 1995 was Iraida Muñoz vda de Rodriguez Quilichini who seems to had been married to the son of Rodriguez Soto. The beautiful owner's house is still in use and very well kept. We could not gain access to take pictures of it though. 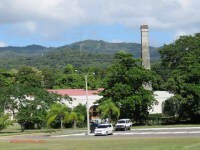 This property, which includes the house and the remains of the sugar factory, were included in the National Register of Historic Places in 1995.